Mascus, the fastest-growing online marketplace in the world for buying and selling used construction heavy machinery, trucks and trailers, agricultural equipment, forklifts and forestry machines, is set to build a series of remarketing tools for Hitachi Construction Machinery (Europe) NV (HCME) and its dealers’ network. With over 40 dealers in Europe and Africa, representing more than 50 countries and hundreds of quality used equipment for sale across the continent, HCME wants to strengthen its remarketing activities and support its dealers with the best tools available on the market. "As manufacturer, we must provide our dealers with tools which enable them to be successful in their markets. Because used equipment is an essential part of the product life cycle, we needed to find a solution so that dealers can manage their used equipment inventory, share this with their peers and market their used equipment easily”, says Tom van Wijlandt, Assistant Manager Service Business Support. Mascus is now building an inventory management system for HCME (intranet) where the dealers can manage their stock of used machines and ultimately market these machines on the Mascus public marketplace and HCME’s used equipment webpage which will also be built by Mascus. “The Intranet is one of the most complex products in our portfolio, which we've tailored specifically with OEMs' needs in mind. It goes beyond a basic inventory management system and offers features such as the possibility to create a stock catalogue or email the stock directly to their customers in just a few clicks, sales history, deep statistics reporting to name a few. On top of that, the intranet will also be feeding a dedicated public Hitachi used equipment webpage that we are building, and of course the Mascus marketplace and others if needed. We are proud to have Hitachi among the list of large manufacturers using our Mascus products; it is a sign that our work is not only appreciated and valued but also brings efficiency and support to our customers' everyday business”, says Rickard Krøtø, COO of Mascus. 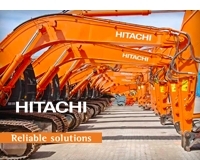 Hitachi Construction Machinery (Europe) NV (HCME) is responsible for the manufacture, sales and marketing of Hitachi excavators, wheel loaders, rigid dump trucks and crawler cranes across Europe and parts of Africa. For more information about Hitachi, visit www.hcme.com.